A flagship mid Wales museum has thrown open its doors after a two year closure which saw it undergo a multi-million pound makeover. The National Woollen Museum at Drefach Felindre in the Teifi Valley re-opened to the public on Wednesday after undergoing a £2m redevelopment programme. 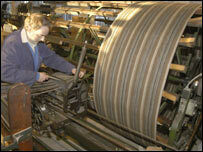 Wool was historically the most widespread and important of Wales' industries in the 19th century. And Drefach was once at the centre of the Welsh woollen industry, being known as the Huddersfield of Wales. 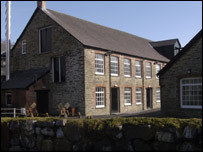 The National Woollen Museum is based at an authentic working woollen mill which had been in continuous production for a hundred years. "Both the mill and the village are a heritage site of enormous significance making the museum a special place with a wide ranging and spell-binding story to tell," said the museum's education officer, Llinos Thomas. The museum will play the lead role in celebrating and telling the story of the Welsh woollen industry with free entry thanks to funding from the Welsh Assembly Government. "The new-look museum will be a welcome boost for the west Wales tourism industry," added Ms Thomas. Restoration work includes a glass roofed courtyard, and historic machinery as well as an imaginative interpretation of the collections. Aspects of the National Flat Textile Collection which includes blankets and shawls will be displayed for the first time in a new gallery. A new Research and Collections Centre will be opening later in the year and will include a room dedicated to hands on learning opportunities. Visitors will also have a unique view of textile production from a raised walkway over the site's commercial woollen mill. Improved visitor amenities include a new shop and café as well as access and facilities for the disabled. WAG Culture Minister Alun Pugh said the re-opening of the Woollen Museum would help to help to bring an integral part of Welsh history to a new audience. "It's important that people are aware of their country's heritage and the re-developed Museum helps to bring this alive in an innovative way that everyone can enjoy, highlighting this important part of our culture," he said. "I am confident the investment of more than £2 million in the museum will boost the local economy and that the Assembly Government's free entry policy will attract even more people to enjoy this heritage." 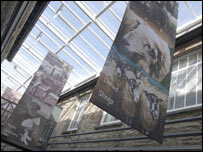 The redevelopment of the National Woollen Museum forms an integral part of the National Museum and Galleries of Wales' industrial strategy. With the support of the Welsh Assembly Government and other funding partners, £40m is being invested in Objective One areas to celebrate the industrial heritage of Wales. The strategy embraces three existing site-specific museums; the National Woollen Museum, the Welsh Slate Museum at Llanberis and Big Pit, the National Mining Museum of Wales in Blaenavon - as well as the development of a new museum in Swansea. The National Woollen Museum is open 7 days a week from 1 April to 30 September and 5 days a week from 1 October to 31 March.